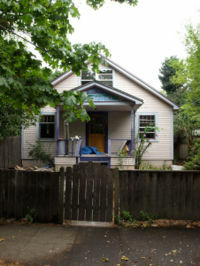 Thinhouse is an experiment in low-energy living in which a family is attempting to reach a 2,000-watt lifestyle by moving into and rehabilitating a 70-year-old house in Eugene, Oregon, USA. A thinhouse is a house on an energy diet. In our particular case: American family of five trades big house in the country, three cars, long commutes, and energy-glut lifestyle for Depression-era inner-city bungalow, bikes, long walks, and lots and lots of insulation. Purpose: Within a tight budget, redo this old house as a model of energy efficiency, and redo our lives. Walk the walk (literally) when it comes to slashing energy use and carbon emissions. Try to get close to a sustainable global average for energy consumption (which means cutting our energy use by 80 percent). Make a more reasonable life. We are that family, and this site tracks our adventures. There are certain things you’ll see us doing – and others you won’t. You will see us trying to find the best ideas for making a dramatically more energy-efficient home in ways that are inexpensive as possible. You will see us stumbling, making mistakes and getting on each other’s nerves. You won’t see us being self-righteous. And you won’t see us giving up. We’re looking to make BIG changes, but at the same time, we worked hard for what we have, and we don’t want to give up our comforts and luxuries. We don’t want to live in a house made out of dried tofu. We don’t want to pedal a stationary bike to run our TV. We don’t want to raise goats in the backyard. (although, if Lauren has her way, we may raise a few chickens). So what do we do if we want to keep a lot of our goodies but stop hogging all the world’s resources? Can we reshape this old house – and our lives – in ways that make sense for the future?